A busy week kicked off with the Jim Wellinghurst 5k on Tuesday followed by a decent track workout on Thursday, and a tough 50k on Sunday. Feeling slightly more like a runner again and hope to carry that momentum well into the fall. The 5k went exceedingly well. I was able to shave 19 seconds of my PR from a couple years ago and ran a 5:07 mile to open (downhill but still fast for my current fitness). The rest of the race was fine and I held on for 3rd behind Nick Brown and Tim Livingston. The course is ~3mi and net downhill so my time of 16:22 is really probably a sub 17 which is where I should be. Thursday I went to the track and randomly landed on a 12 x 60s workout (I loaded my calendar this summer with a bunch of 5k workouts and when I'm not too banged up I make the effort to incorporate into my training). It was early afternoon and HOT but I was able to knock out some consistent reps (5:06 avg). The Ragged 50k was long anticipated race this summer since I hadn't "run" anything that long since last year. Sure, I've logged time on my feet mixing up running and hiking, but not at a race effort on a highly runnable course. So as with all ultra races, there are many variables going in - training, pre-existing injuries, taper, sleep - and on race day - weather, gear, nutrition, heat, injury, staying on course, blowing up. This makes it exciting and opens up the podium to a deeper field than road races. I was confident going in that I could have a strong race but knew I wasn't tuned up to run anything crazy. I also don't do well in the heat and it was predicted to hit 80 by mid day. And sustaining a race effort for 5-6hrs also sounded like a lot to ask for since I spent the past week hiking in the Adirondacks. Still, I was excited to run with some great runners from New England. The race started off very smooth. I ran with Brandon Baker and Ian Ridgeway for the first 12 miles. Brandon took a little longer at the aid station and that would be the last we'd see him although he was just a few minutes back for much of the race. Ian and I were tailed by Eric Harbeck until mile 20 or so. Ian and I caught up with Brian Rusiecki around mile 12 or 13 and we hung with him for the next 10 miles. Brian had also logged ~50miles over the previous two days and I was blown away that he was able to grind out this 50k the way he did. When we caught him I thought for sure we'd drop him but he dropped us! At mile 25 we caught Brett Mastrangelo who had missed a turn and went a half mile in the wrong direction at mile 23. Not sure what happened but he eventually dropped at the mile 26 aid station. At the mile 26 aid station I arrived as Ian left and Brian was no where in sight but probably just a minute ahead. 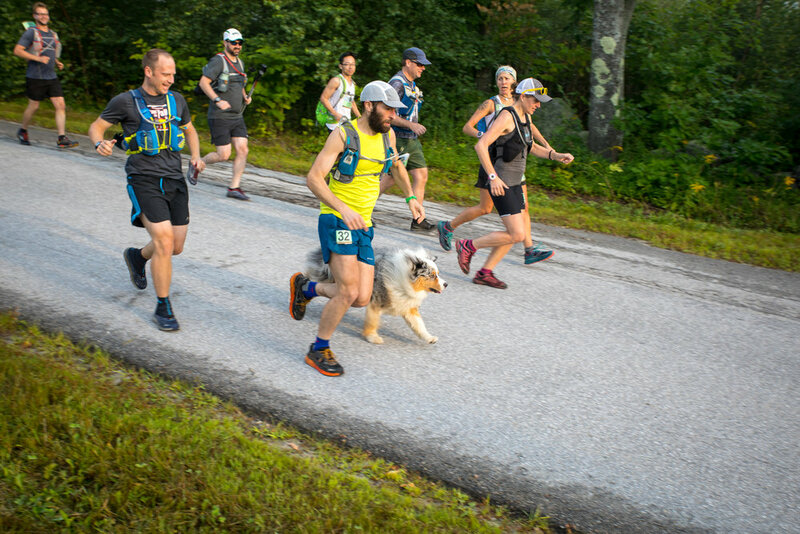 I was experiencing some bad quad and calf cramps that started to appear climbing out of the mile 19 aid station - big red flags that I had pushed hard for 3 hours and it was time to back off. I slowed down and did some more walking from 19 to 26 but it didn't really help. At mile 28 I rolled an ankle and supermanned in the dirt. Full calf cramp, I got up and limped it off and repinned my bib that had ripped off my shorts. Luckily I was fine and was able to still run, albeit an 8:18 split, on the next dirt road section. I knew there was another aid station at mile 30 and my goal was to just get there then rest before the final climb. Mentally, I had succumbed to 4th place and would defend it (as possible) but not push too hard on the last few miles because my legs were cramping up so badly. I limped up New Canada Road (1 mile climb up a dirt road) to the aid station and pounded a liter of water before heading up the Ragged Mtn trail. This was mostly hiking but I found baby steps resulted in less cramping. It was a tough grind with lots of looking in the rearview but I was able to keep pushing forward. At the summit I was psyched to see Tom Hooper (the RD) and he said just 1.5 miles down the ski trail. The descent was welcomed but also triggered a few softball sized calf cramps. I looked back on some big stretches and realized I could coast it in. I finished in a time of 5hrs 31mins - solid race effort and I'm happy to not have blown up as baldly as I had in the VT50 last year - although if I had to run 14 more miles, I'm sure it would have ended badly. While I'm excited to log another 50k, the cramp issue is frustrating because my legs still felt strong but were debilitated by the cramps. They have limited me on all ultras to date regardless of electrolytes / nutrition. I'm almost positive it's all fitness related and I need to run more consistent long runs. In hindsight, I should have taken 45 seconds every five miles and rotated stretches through quads, calves, and hammies. This would have let my system relax and hopefully stave off cramping enough to let me close the race. If my fitness isn't good enough to sustain my perceived 50k effort, then maybe 5 minutes of rest and stretching over the first 2/3 of the course could have let me close 10 minutes faster? Who knows but it's something I'll definitely take into consideration in the VT50.